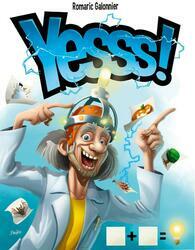 In the game Yesss !, only communication between people will save humanity from itself! Professor Emmet BLUE, a mad scientist but awesome, is convinced. He therefore invented an experiment to increase our mutual understanding. His students must translate an association of two images into a single concept, which can be understood by others. Purpose of the game: To gain the most brains by guessing a pair of objects but using only one word. Will you be the brightest disciples of Professor BLUE? Yesss!